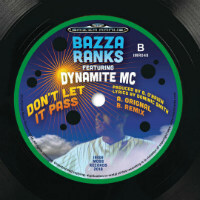 Next from Bazza Ranks is Don’t Let It Pass on which he hooks up veteran dancehall vocalist Dynamite MC with yet another bass-heavy bashment beat on vinyl 7″. This time it’s so that Dyna can hold forth about how frustrating it is when you’re in a circle and something isn’t passed to you quickly enough. 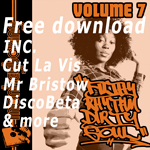 Oh what – like a dutchie’? Sort of. More ‘the purple’ in this case. I wonder what sort of video imagery could fully capture both the frustration of being in a circle of smokers that delays your gratification because it keeps letting in newcomers and the nature of said gratification when/ if it arrives. What about alternating between lurid kaleidoscopic visuals and a birds’ eye view of the clouds. Yes – that should do it.